The roof is easily one of the most important parts of a house. It provides protection from the elements and insulation from the heat and cold. So, when it is time to renovate your roof, you should choose the best roofing material for the job. Shingles are one of the most popular roofing options because of their affordability, easy installation, and reliability. Pacific Green Homes will help you to choose the right type of shingle for your home, starting with this guide to shingle roofing in Los Angeles. This is the most common roofing material in the country because it is inexpensive, easy to install, and easy to repair. Most modern asphalt shingles have a fiberglass core for extra reinforcement. Affordability – They are the cheapest option in terms of purchasing, installation, and maintenance. Easy Installation – Installation is the fastest and easiest of all the roofing materials. Simple Maintenance – Repairing or replacing damaged shingles is easy and inexpensive. Light Weight – They are very light, so no reinforcement of the roof is necessary. Visual Variety – They are available in a wide variety of colors and styles. Fire Resistance – These shingle types have a Class A fire rating, which is the highest. Longevity – They can last for 15 to 30 years, which is shorter than other roofing materials. Environmental Impact – Asphalt uses petroleum products in its manufacturing and are only occasionally recycled, often ending up in landfills. Temperature Vulnerability – They can buckle and crack when the temperature fluctuates suddenly, necessitating repairs. Poor Wind Resistance – They can get damaged in high wind conditions, which can lead to repairs or replacement of damaged or missing shingles respectively. Also called EPDM (ethylene propylene diene terpolymer) shingles, they can look similar to asphalt or wood shingles. Affordability – The purchasing and installation cost of rubber roofing is quite low. Longevity – They can last from 30 to 50 years. Environmentally Friendly – They are made from recycled materials and can be recycled at the end of their life cycle, so their environmental impact is very low. Energy Efficiency – Rubber reflects heat during the summer and provides insulation during the winter, reducing heating and cooling costs. Low Maintenance – Rubber roof repairs are quick and easy. High Resistances – Rubber is resistant to fire, insects, and mold and mildew. Appearance – It is not as attractive as other types of roofs and the color can fade over time. Difficult Installation – This is a fairly new roofing material so finding an experienced installer can be difficult. Impact Vulnerability – They can be damaged by falling tree branches, but repairs are fairly simple. They are usually made from cedarwood, and the difference between the two is that shingles are machine cut and have a smooth, uniform appearance. Shakes have a more rough-hewn look and are thicker than shingles, they are also more expensive. Unique Beauty – Wood gives the home a charming, rustic look. The nature of wood means that no two wood roofs look the same. Energy Efficiency – They keep the home cooler during the warmer months and provide insulation during cooler weather, which saves on heating and cooling costs. Environmentally Friendly – The wood is sourced from sustainably grown forests or from salvaged logs. They can be recycled into mulch or wood chips at the end of their life cycle. High Cost – They are much more expensive than the other types of tile roofs. Longevity – They can last for 20 to 30 years, shorter than most other types of roofs. Fire Vulnerability – They are more vulnerable to fire than all other roofing materials, but they can be pressure treated to receive a Class A, Class B, or Class C fire rating. Moisture Vulnerability – Mold and mildew can set in if they are damp or wet for extended periods of time. High Maintenance – Keeping a wood roof looking pristine can be expensive and time consuming. Specialized Installation – Wood roofs need to be installed by experienced specialist in order to prevent future repairs. Shingles are generally more popular in cold weather environments, but modern manufacturing techniques mean that they are a good option for any climate. 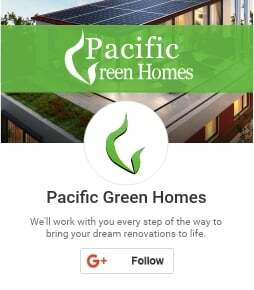 If you are interested in shingle roofing for your home, then call Pacific Green Homes for a consultation to see if they are the right choice for you.